PALO ALTO, Calif., Jan. 25, 2017 /PRNewswire/ -- Jive Software, Inc. (Nasdaq: JIVE) today announced that Red Thread, a leader in creating innovative physical office environments, recently launched a beautifully designed virtual environment for its own employees using the Jive Interactive Intranet solution. As a result of this new digital workplace, dubbed the "Red Thread Virtual Café," the company has fostered stronger connections between employees, increased strategic alignment and enhanced project collaboration. With Red Thread employees dispersed across thirteen locations, even co-workers who spoke regularly over the phone often did not put a face to each other's names before Jive. In addition, executives and employees alike fell into the habit of sending company-wide email blasts for announcements and ad hoc questions, rather than selecting appropriate internal audiences to target. The company wanted to create a more strategically unified culture by replacing its static repository of HR forms and overreliance on email with a vibrant virtual space where employees could connect, share ideas and content, and discuss projects, clients and strategic initiatives. "After interacting with our key partner, Steelcase, via its Jive-powered dealer community, we immediately saw the value of this collaborative approach and knew it was time to replace our stale, document-centric intranet with something that better reflected our company mission of creating inspiring workplaces," said Amy Holt, vice president of marketing at Red Thread. "Our Virtual Café has reinvigorated Red Thread's culture and transformed internal communications and collaboration. Jive's intuitive, customizable desktop and mobile interfaces help us serve clients even better and faster than before because they seamlessly facilitate connections and engagement throughout our distributed workforce." The company rolled out its Virtual Café to hundreds of employees in 2016. It quickly reached a milestone of 75 percent active users, who have created rich profiles and posted documents, blog posts, videos and other content. Colleagues are sharing strategic initiatives and celebrating each other's new wins, outstanding project efforts and other important milestones in Jive—forging more personal connections and tighter alignment around common goals. 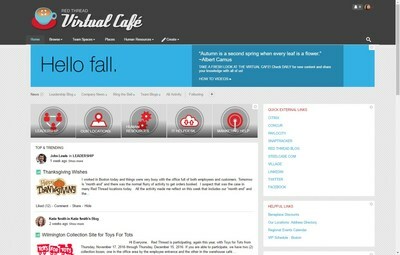 In the Red Thread Virtual Café, permissions-based collaboration groups bring together departments and cross-functional project teams on the fly, and executives share important messages with the right audiences. For example, the company's CEO and other executives use Jive to publish regular blog updates on everything from the company strategy and new team members, to progress on goals and processes. Another benefit of the interactive intranet is accelerated employee onboarding, now that new hires have an easy way to get to know their peers, find key forms and documents, and access all of the business applications they need from one central collaboration hub. In addition, many employees have formed ad-hoc personal interest groups in Jive, creating another way for distributed colleagues to get to know each other better. And employee satisfaction teams at various offices use the Virtual Café to promote their "Culture Club" and "Grateful Thread" events—engaging not just small local groups, but the entire company through photos, videos and other activity updates. "Many service organizations do great work for their clients, but still struggle to form personal bonds between employees and connect knowledge experts across siloed teams," said Robert Block, chief customer success officer at Jive Software. "Red Thread is an innovative company and an excellent example of our many Jive customers who have successfully embraced collaboration to drive employee engagement and alignment, and ultimately deliver even better client service." Red Thread is an authorized dealer of furniture-manufacturer Steelcase, another Jive customer. The company helps create innovative environments that inspire people to excel wherever and however they work. Red Thread leverages its integrated interiors capabilities to transform workplaces throughout New England by translating vision to reality—from design concept through implementation and ongoing support of workplace furniture, audiovisual technology, flooring and custom solutions. Red Thread is one of many companies that use Jive to support critical human resources and corporate communications goals, such as establishing a unified company culture, increasing employee engagement and driving strategic alignment. Businesses such as ADP, GoDaddy, Grant Thornton, Pearson and Plex Systems have deployed Jive's Interactive Intranet solution to enhance communications and collaboration between executives, departments and geographical locations.